EDUCATION: St. Joseph’s University (B.A., 1990); Interamerican University of Puerto Rico (J.D. 1993); Tulane University School of Law (LL.M. in Admiralty, 1995). REPRESENTATIVE CASES: MAPFRE Puerto Rico v. Guadalupe Delgado, 613 F. Supp. 2d 213 (D.P.R. 2009); Lloyd’s of London v. Pagán Sánchez, 539 F. 3d 319 (1st Cir. 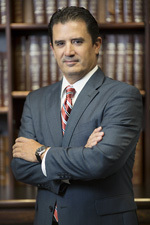 2008); Rodríguez v. Hoyos, 2008 AMC 891 (D.P.R. 2008); Sylva v. Culebra Dive Shop, 389 F. Supp. 2d 189 (D.P.R. 2005); Kunkel v. Motor Sport, Inc., 349 F. Supp. 2d 198, 2004 AMC 1600 (D.P.R. 2004); Pan American Grain Manufacturing Co. v. Puerto Rico Ports Authority, 121 F. Supp. 2d 710, 2000 AMC 692, 193 F.R.D. 26; aff’d, 295 F.3d 108, 2002 AMC 1988 (1st Cir.2002).